The unit was formed in late 1861, and by late August 1862 they still had yet to be in a real battle. One of their regiments, the Second Wisconsin had fought at Bull Run as part of another unit, but they were the only true veterans of the four regiments that made up the brigade. The battle at Brawner Farm opened the Second Battle of Bull Run (or Second Manassas, depending on which side of the war you put your sympathies), and was an accidental encounter. Fought mostly after dark – something that rarely happened in 19th century warfare – it was particularly brutal. At times the opposing sides were less than 75 yards apart, essentially point- blank range for the rifled muskets of the time. The muzzle flashes lit the night and the report of rifles and canon were so constant that survivors likened the ninety minute battle to a continuous thunderstorm. Not much has been written about Brawner Farm, most consider it merely prelude to the following two days’ larger fight. 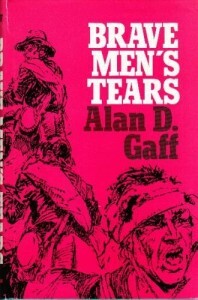 One author, Alan D. Gaff, wrote a treatise on the battle, “Brave Men’s Tears”. Long out of print, it’s a wonderful account, backed by solid research and footnotes, and gives an infantryman’s view of the battle. Only in recent years has the focus of Civil War research turned from the big picture and the lives of the Generals, to the men, and even a few women, in the rank and file that fought the battles. Gaff’s book, printed in 1985, seems to have been at the forefront of this movement, and it doesn’t disappoint on the personal details of the everyday soldier. 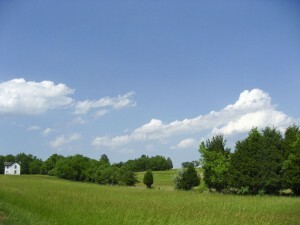 The Brawner Farm has only recently been opened to the public. In private hands for generations, it’s now part of the Manassas National Battle Field Park. Several years ago I found the place, at that time unmarked and still very much a work in progress. No markers for the site, I used a map of the area from 1862 and just pulled off the road at one point and looked to my right and saw what I knew had to be the farm. Other than the “turnpike” being paved, it looks much as it did back during the war. I returned the next day and took some photographs, that the 19th Indiana Iron Brigade website now hosts, and walked the fields on a hot and humid day, much like the weather the battle had been fought in. The Iron Brigade didn’t win their name at Brawner Farm, but it did begin their legacy of fighting hard and taking the high casualties that entailed. The 19th Indiana lost nearly 50% killed, wounded and missing, of their number in that one ninety minute fight. In the fights to come those percentages would be even higher for the 19th and the other regiments in the brigade. Indeed, at the end of the war, the units of the Iron Brigade would claim the highest casualties of any Union forces. Also telling was that the highest casualties on the Confederate side would be those units that fought against the Iron Brigade. I have yet to completely understand how and why the men of the Civil War fought the way they did. To stand shoulder to shoulder and face unceasing fire coming from a short distance in front of you took something that I’m not sure I — or most people living today — can understand, much less embody. Sure, there’s the typical responses of “defending the Union”, “defending our rights” and other phrases that politicians and historians have conjured to try to give meaning to over a half-million dead. We’ll probably never know the true motivations of these individuals, and any truth would be diluted by a century and a half of time, but standing on Brawner Farm, where the land still slopes up into a treeline just past a chicken coop, you can at least get the feeling of what it felt like to stand there that night, regardless of what brought those men to that grassy hill.